Do you want to learn how to get Apple to feature your App? Today, we’ll share the five key steps you need to take to help you get Apple to feature your app and gain major exposure for your game. Let’s dive right in! There is no secret! Apple is specific about what type of apps and games they want to promote and how you should go about creating them. If you want to get featured by Apple, you have to design your game with Apple’s platform in mind. Simply making a great game isn’t enough, you have to make a great iOS based game. First, you need to study the App Store. Make it a habit of researching and analyzing the games that get featured each week. Studying and researching featured games, will give you a good idea of the direction you should take when you’re designing your game. 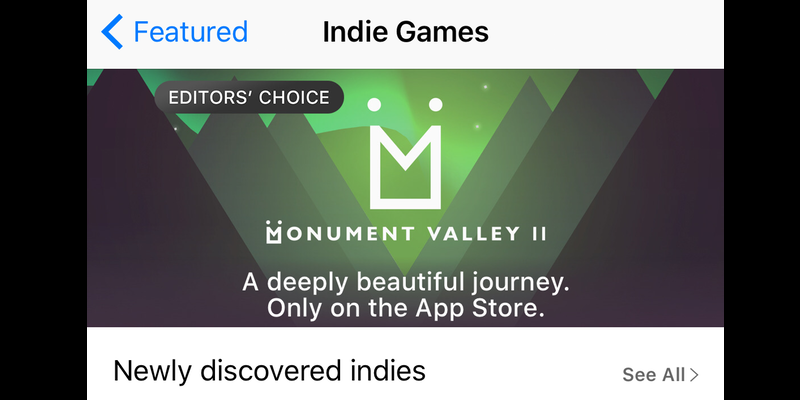 Visit the App Store homepage and view all of the featured games and stories. Jot down the game names and download the ones that catch your eye. Pay attention to the art style, gameplay mechanics, icon, screenshots, features, and themes. Look for any reoccurring patterns or trends and make a note of it. Then try to investigate even further and examine their App Store page listing. Read their reviews, visit the developer’s website, and Google the game to see which media sites have covered them. It’s also important to keep up-to-date with Apple’s new features. This is HUGE! Apple loves to promote apps that include iOS based features, especially the ones that they’re currently highlighting. So frequently check their website for the latest updates. Try to add new iOS features, technology or aspects that Apple values to your game to increase your odds of being selected. 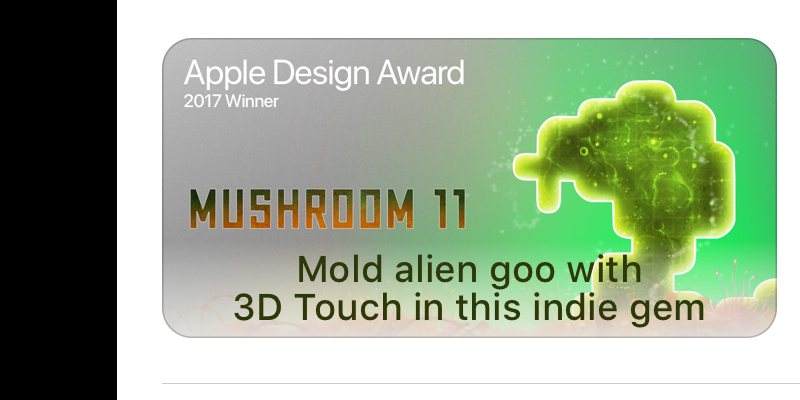 For example, Untame Games created the indie hit Mushroom 11 which was recently featured by Apple as Editors’ Choice and won the 2017 Game Design Award. The indie title was not new to the scene, it had been available on Steam and multiple platforms prior but Untame Games turned their great game into an innovative iOS game by adding Apple’s 3D touch control feature. When you view their App Store page listing, it’s noted in the description that the game features an ‘iOS Exclusive: Force Touch enabled for a fully immersive experience.’ Adding Apple’s new features can give you an advantage when you’re trying to get featured. Showing loyalty to the Apple brand is also a method that you can use to design your app to be feature worthy. Releasing it solely on iOS or first on the platform can work in your favor if you use it as an angle in your pitch to get featured. Ustwo’s Monument Valley 2 is an excellent example of this strategy in action. The game’s feature tagline reads, “A deeply beautiful journey. Only on the Apple Store.” Although the first version is available on both iOS and Android, the sequel is only currently available on iOS. You can also try integrating high valued features like IAPs (In-App Purchases). Not only do these bonuses boost replay value but they also stand out to the editorial team. 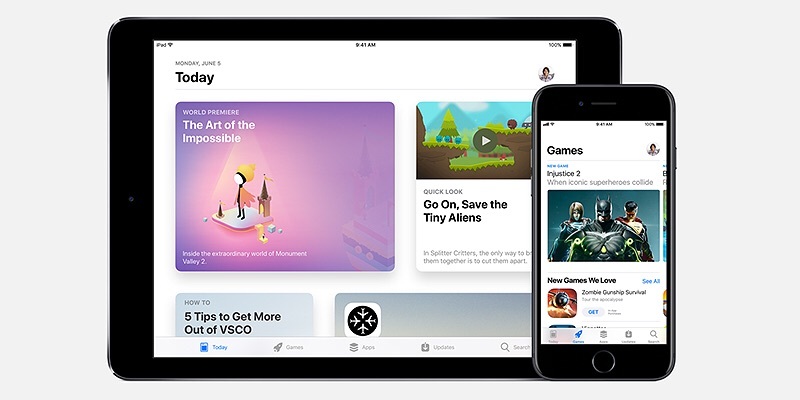 Apple is starting to put a higher emphasis on promoting IAPs with the new iOS 11 App Store design. App Store page listings will have a special section showcasing available in-app purchase items for your game. Developers will be able to highlight their best items, characters or upgrades directly on their app page. Remember, Apple generates revenue from apps that have in-app purchases so including this factor can also help you get featured. You can find more information on what editors are looking for on Apple’s discoverability page. Also, keep in mind that they only feature apps that are new or include major updates. Before you start pitching to get featured, it’s paramount that you make sure your app is ready. Apple is all about aesthetics. If you take a look at the App Store homepage, most if not all of the featured games have high-quality graphics. Make sure your game’s icon, screenshots, and graphics are all top-notch. It’s also important to add polish to your game. Polish equals quality. To add polish to your game, you have to look it over and find any minor or major details that you can improve on. Don’t rely solely on your judgement for this step. Seek out beta testers to help you find errors and get valuable feedback on your game. Make all the necessary changes and then re-test. Repeat the process until you have a polished well-designed game. Every aspect of your game should be cohesive and high-quality from the art-style and UI down to the game’s core mechanics. If you’re trying to get an app that you’ve previously released featured in the App Store, you need to have a significant update. Again, testing is essential. Use testers to find areas where your app or game can be improved and other issues that need to be addressed. Then make all of the necessary changes. You’ll also need to add new content to your game when updating to get featured by Apple. This can be in the form of new worlds, game modes, characters and of course special features. As we mentioned earlier, adding Apple based features can increase your odds of getting noticed. Getting press coverage and features often go hand in hand. One can land you the other and vice versa. So, it’s vital that you reach out to press to see if you can get sites like Mashable, Tech Crunch, Touch Arcade, and others to endorse your app. When you receive media coverage, you’ll have social proof that your game is great and deserves to be featured in the App Store. You can use this social proof to your advantage in your pitch to get featured by Apple. Your hook or USP describes what makes your game great. It’s the tagline that you’ll be using to promote and pitch to not only journalists but to Apple to get featured as well. To come up with your hook, play and analyze your game. Look over your feedback from testing and create a list of features and reasons that describe what makes your app special. Is your game a hybrid of two other popular games? Does it include the latest features from Apple? Then examine the list and select the best hook to use to push your app. Once you’ve nailed down a hook, you need to create a press kit. A good press kit will have a gameplay trailer/preview, icons, high-resolution screenshots, any additional banners or logos and a press release or text document with information about the game. In general, your game trailer should be 30 to 90 seconds in length. However, Apple is now allowing up to three app previews (30-second limit) to be added to your App Store page listing it’s wise to create multiple versions of your trailer as well. Create one standard 90-second trailer to use to pitch to journalists and for promos. Then edit or re-create three 30-second versions of the trailer with each video highlighting different key features of your game. Use the 30-second previews for your App Store page listing. Remember, when you’re creating game trailers you have to grab the viewer’s attention, zero in on your hook and get them excited about your game. The goal is to excite, entertain, and explain. Make sure to include 3-5 high-resolution screenshots of your game in the press kit also. Your gameplay screenshots should show your game in the best possible light. Try to take screenshots that point out your game’s features and uniqueness. Include high-quality icon, logos, and banner images in your press kit as well. When you write your press release, try to focus on your app’s USPs. Then convert the files into a downloadable link or create a digital press kit page on your app’s website that’s easily accessible. Use your App Store research to help you create a press list of potential journalists and game reviewers to contact. Google each writer and read some of their work to see if they are worth pursuing. If they are, find their contact information and add it to your list. If you can’t find their email address, you can try using tools like VoilaNorbert, Found.ly, or Rapportive. When you’re emailing press, the information that you’ve gathered in your press kit is your secret weapon. Use the press kit, your hook, and research to help you make every pitch you send unique and distinctive. Keep your pitch to journalists short but detailed and always include your press kit link or page URL. All of the apps and games that are featured in the App Store are hand-picked by Apple’s editorial team. So, it’s important to make genuine connections and build up a rapport with individuals who work at Apple if you want to get featured. Establishing a relationship with someone at Apple can give you the upper hand when it comes to getting features. One of the best ways to network and connect is by attending conferences and major events like WWDC. Attending events is an excellent way to meet and build a relationship with Apple employees that can put in a good word on your behalf or feature your game if they happen to be part of the editorial staff. You can also network with Apple’s staff through social media. Join LinkedIn and enter ‘App Store Manager’ into the search box. Filter the results by your preferred country or location and look for people managing the category that fits your app. Connect with them on LinkedIn or use the Chrome extensions like Email Hunter to help you get their email address. Check out their other social media profiles like Twitter and Instagram and find out more about them. Maybe they have a particular hobby or movie that they enjoy. You can use that knowledge as a conversational piece to connect with them. If you want to get featured by Apple, you can pitch your app directly via their website. In the past, developers were able to email Apple at appstorepromotion@apple.com or appoftheweek@apple.com, but this contact method is no longer valid. Apple has created a form for developers to submit if they want to pitch their game to get featured. You can locate this form at https://developer.apple.com//contact/app-store/promote/ when you log into your developer account. Or you can access it from the contact us link at the bottom of Apple’s discoverability page. In the Developer Information section, you have your contact details from your account, and you only have to type in your developer name for the app that you’re pitching to get featured. The next section is the much longer, it entails all of your app details from the app name, category, countries releasing in and business model to the release date. It also includes a ‘Describe Your App’ section. In this area, you need to list your game’s key features and any supported Apple technologies. There is a 1,000 character limit, so be concise. Use your hooks (USPs) and list any significant Apple features (i.e. 3D touch). Also, mention your business model and if you have any noteworthy in-app purchases available to engage players. The final section of the form is called Your Story. In this area, you have to craft your personal story. Provide Apple with a little bit of background info on who you are and what inspired you to create your game. Take some time to brainstorm and write a brief but compelling narrative. Mention your game’s unique features and gameplay mechanics. Try to make a reference to any social proof or press coverage that your app has received as well. Write down the date that you submitted your pitch to get featured by Apple, and keep it for your record. Recording it can help you determine if and when to follow-up or re-submit if necessary. Sometimes Apple doesn’t notify you when your app has been selected. So continue to check weekly to see if your game has been featured. Getting your game featured in the App Store is not guaranteed nor an easy task, but if you do get featured, it can open up a lot of doors. Use these steps to help increase your chances of landing a feature on the App Store! Great content. Thanks for sharing this insights and deeply explanations. Thank you, good article. I have a question. In Game App cases, Automatically Interconnecting my game with Apple GameCenter is important to get featured? I heard it co-workers, but I have doubts about whether what he said is true. In my point of view, I don’t want to notify my friends of my playing a game. Yes do it. It adds value to the ‘feature’ possibility. Does Apple contact you or they just feature the app directly? In general, if Apple needs any additional info or images for feature banners, they’ll contact you directly through the developer dashboard, but they don’t always send you an email notification when your app is featured. So, it’s important to check the charts or use tools like App Annie to see if your app has been featured. Apple will contact only if they are going to feature (big time) the game with banners etc. so you will provide them the creatives according to their instructions. And you must be kind of prepared because they won`t wait for ages. For features like ‘New Games We Love’, ‘What We Play Today’ or so, they won`t contact, they will just feature it and you`ll get more than 30million impressions in 3-4 days (the downloads depend on how appealing is your game to the masses – expect at least 200k installs during the feature period). Hi! great article. this game Mushroom 11and Monument Valley 2 were made in buildbox? Thanks, :) Angel! No, neither game were made with our software.